Colorado is actually quite a dry place to live, despite the green that seems to be all around us. Plants and wildlife that thrive here are adapted to do with less water than those you will find in other climates. So, you’d think that Coloradans would have less trouble from mosquitoes than we do, but we’ve got what we’ve got, and that is definitely mosquitoes. If you live anywhere near a lake or relatively still body of water, you will have mosquitoes, with or without municipal spraying. We are Colorado Pest Management, and we practice a form of environmentally friendly pest control that is known as Integrated Pest Management (IPM). One big part of IPM is prevention and so this week’s article will look at prevention of mosquito populations. 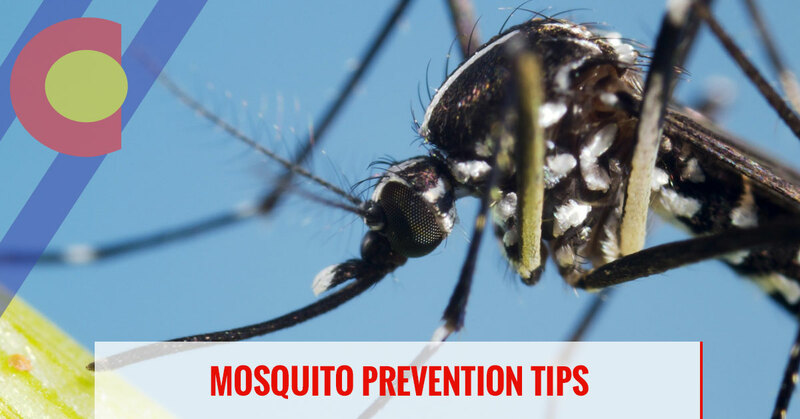 Apart from avoiding their itchy bites, preventing mosquito populations from surging around your home will protect your health. In 2016, there were 149 human cases of West Nile virus in Colorado. This mosquito-borne virus is potentially deadly to humans as well as wild and domesticated animals. Other illnesses transmitted by mosquitoes found in Colorado include Western Equine Encephalitis (“Sleeping Sickness”), and St. Louis Encephalitis. There is little threat of a local outbreak of Zika virus because there is no established population of the type of mosquito that carried it, but there is no reason to not take the other viruses quite seriously. There are some easy, logical steps you can take to help minimize the chances of a population boom in your yard. Check for leaks. A leaky faucet can create a small standing puddle that mosquitoes can use to lay eggs. If you have a boat, RV or other outdoor items that is covered by a tarp, make sure that no water has collected in dips in it. Pull the tarp taught to avoid water gathering on it in the future. Check flower pots, swing sets, and any junk like old tires for standing water. It takes just 48 hours for mosquito eggs to transform into larvae and they need just 10-14 days—depending on the ambient temperature—to turn into hungry, biting adults. If you make the rounds around your property just once a week, you can make a big difference in the mosquito population. Check your gutters to see if they are angled properly, and water is being completely emptied out of them. Check troughs at the end of the downspout for standing water as well. If you’ve taken advantage of the new law that allows Coloradans to have a rainwater collection barrel, check it to make sure the screen on in is intact or it could be being used as a mosquito nursery without you even realizing it. If you have any type of water feature in your yard, from a bird bath to a fish pond, make sure you have mosquito control features such as minnows frogs to eat them, or Mosquito dunk to kill them. These are some common sense actions you can take to discourage mosquitoes breeding in your yard, but these buggers fly so be sure to exercise additional caution including wearing long sleeves, staying indoors at dusk, and using mosquito repellent. If you need more help with mosquitoes or other common, or uncommon, pests, call Colorado Pest Management, and we’ll see how we can help. We give free estimates for most pests and always turn to the most environmentally friendly methods first and do our best to treat even pests as humanely as possible.